Do they really help? Are they worth the extra expense? There are pet foods advertising that they prevent hairballs, prevent or retard dental disease, protect against sensitive skin conditions, protect against obesity, treat sensitive digestive tracts and various combinations of the above! Let’s explore which of these is really worthwhile. Hairball preventive/ protective foods are usually helpful. However, they don’t work equally well for all cats. And, the secret ingredient is nothing tricky: psyllium. The stuff Metamucil (r) is made of! This digestible fiber helps with hairballs by gumming the GI contents together, promoting a more rapid transit time. So fur gets stuck in the food digesta and processed out of the stomach faster– before it can cause vomiting, and out into the litterbox faster and smoother. Any diet can be made into “Hairball formula” at home by sprinkling a small amount of unflavored generic Metamucil on your cat’s food. But, that’s one more thing to do in the morning. For the convenience, if your cat has hairballs, it MAY be worth the price. Dental diets have revolutionized the level of are that owners can give their pet’s teeth! Studies have shown that Dental Diets can reduce the amount of tartar or pets’ teeth by 80%! And, since diet and dental care are probably the #1 and #2 Best Things that you can do for your pet’s overall health, Dental Diets usually take care of both! Grocery store brands of dental diets are OK, but Premium brand dental diets are better *. These diets usually have larger kibbles, forcing dogs and cats to actually chew their food– not just swallow whole!. Some have enzymes to help break down accumulated tartar, and calcium binders to lower the calcium content in the saliva (which causes the hardened “calculus” that forms on animals’ teeth). Dental diets are especially helpful for pets showing a tendency toward dental disease or those who won’t allow their owners to rush their teeth. When these diets help reduce the numbers of times that a pet has to undergo anesthetic professional cleanings, that saves them from the procedure and you the expense. That’s WORTH the expense, in my book! “Sensitive skin” formulas can be helpful to pets with inhaled allergies or contact allergies because they help improve the skin’s natural immune barrier. This has recently become a focus of interest into why some animals (and humans) have more skin allergies than others! The Sensitive Skin diets can sometimes be helpful in pets with food allergies as well IF the pet is allergic to an ingredient that is NOT included in the diet. Beware: over-the-counter diets that claim to be for sensitive skin are NOT the same as a truly “Hypoallergenic diet” that may be recommended by a veterinarian. However, a 3 month trial with a sensitive skin food– with nothing else passing the pet’s lips– will tell you how much it can help your pet. “Sensitive Stomach” formulas work great for some pets with chronic diarrhea or vomiting, especially if they have food intolerances. These diets also improve gastrointestinal health by supplementing fatty acids, probiotics (healthy gut bacteria) and prebiotics (nutrients to promote rapid growth of probiotics). Just about any pet can benefit from these supplements. And, sometimes, it’s just a matter of trying a diet for a couple of months (again, with nothing else passing the pet’s lips) to see how much it can help. Definitely WORTH the extra expense if the diet cures the vomiting or diarrhea issues! “Inactive”, “Lite”, “Redued calorie” are all labels that invite human consumers to purchase pet foods for their obese pets. Unfortunately, there is nothing necessarily low calorie about these foods, according to a 2010 study by Tufts University *. There are few regulations on when pet foods have to list calorie density (the amount of calories pe rserving) on their packaging. And, with such variety on the recommended serving sizes for pets, it’s very hard to know how to begin helping an overweight pet lose the extra pounds. You sure Can’t Rely on the Package claims to give you any guidance. Your best recommendations will come from your vet. If you can find out how many calories your dog or cat food has, your vet can calculate how much you need to feed to help an overweight pet lose extra pounds. Beware: these diets are often misleading in their labeling! Dental diets made by the Premium food companies (Royal Canin(tm) and Science Diet ™ ) are terrific for pet’s prone to dental disease! If your pet has no health issues requiring a special diet, these diets are great nutrition and great dental care in one package! Sensitive skin diets are always worth a try, but check with your vet first. If your pets has sensitive skin issues, there is probably an underlying disorder that your vet can help with to maximize your diet success. Sensitive stomach formulas are good for almost all pets and certainly worth a try for pets with chronic diarrhea or vomiting issues. Again, though, consult your vet as there are often serious underlying reasons for chronic vomiting and diarrhea that may need to be dealt with as well. “Low calorie” diets usually are not what they are “cracked up” to be. If you really want to help your pet lose weight, consult with your vet about the calorie content of your pet’s regular food. 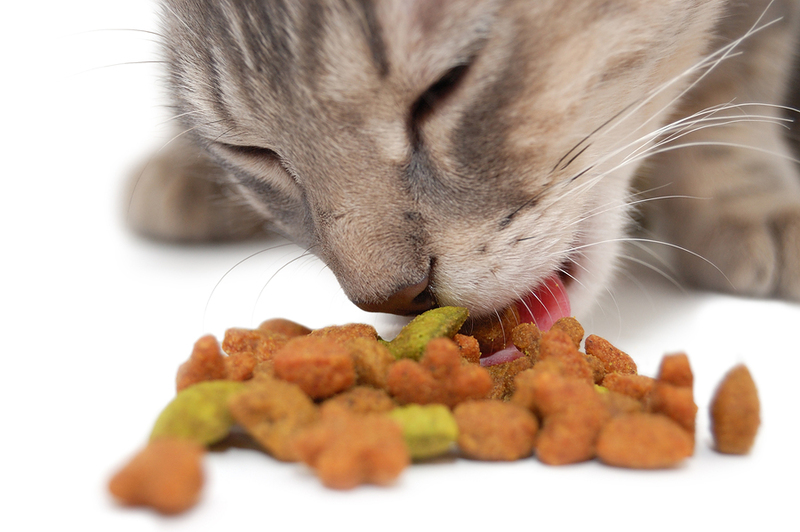 Your vet can help you figure how much of your pet’s regular food to feed to help your pet lose weight. If the food you feed is extra high in calories, your vet can recommend a lower calorie food!